A brilliant front running ride by Michael Walker saw Classic Uniform score an all the way win in the Group 2 $500,000 Ilive Appliances Hill Stakes (1800m) at Randwick today. 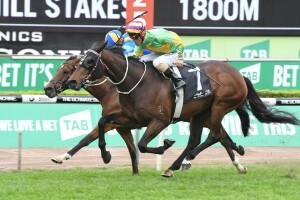 Classic Uniform, above, scores an all the way win in the Hill Stakes at Randwick. Photo by Steve Hart. Walker as able to bounce the Gary Moore trained Classic Uniform straight to the front and dictated the race from that point. Walker then slowed the pace in the middle sections which was enough to save some energy for Classic Uniform ($7.50) who was able to hold the strong challenge of the runner up Embley ($10). Third place Mackintosh was sent out as the well supported $2.80 favourite but after over racing for Joao Moreira in the middle stage, found wanting in the straight and couldn’t peg back the leader. The win on Classic Unifrom wrapped up a winning double for Walker who had won the previous race, Listed $125,000 Schweppes Dulcify Quality (1600m), on the James Cummings trained Ataraxia. Walker said the he following trainer Gary Moore’s pre race instructions of letting Classic Uniform find the front and roll along. “I owe all the credit to Mr Moore. He told me to let him run over the crossing and see if you can get some easy sectionals, which I did.” Walker said.